Administer once a month for protection against fleas and heartworm disease and treatment and control of hookworms, roundworms, and ear mites. Revolution is a prescription-only, FDA-approved medication available only through a veterinarian and is NOT a pesticide registered by the EPA. 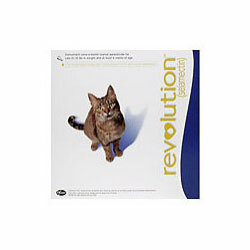 Although topically applied, Revolution is a systemically acting, broad-spectrum parasiticide that has a well defined safety profile combined with excellent efficacy to help protect your cat against a wide variety of parasites. Important Safety Information: Do not use on sick, weak, or underweight cats. Use only on cats 8 weeks and older. Side effects may include digestive upset and temporary hair loss at application site with possible inflammation. In people, REVOLUTION may be irritating to skin and eyes. Wash hands after use.